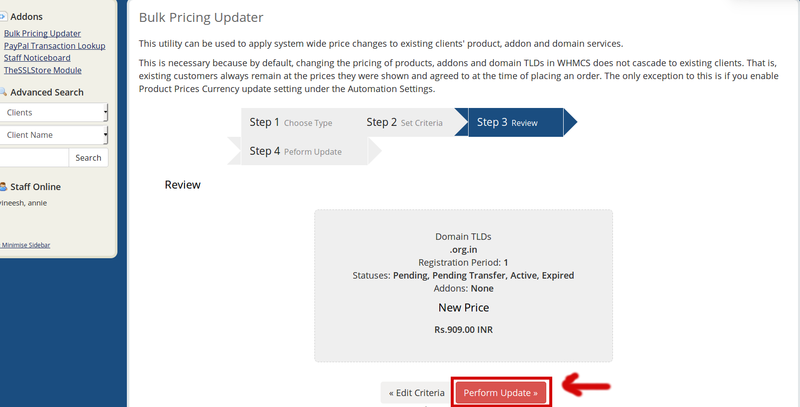 Today I am going to explain how to change the renewal prices for existing clients products and domains using the Bulk Pricing Updater Tool in WHMCS. 1) Login to WHMCS admin panel. 4) Next navigate to Addons > Bulk Pricing Updater. You will be presented with the interface below. 5) Begin by choosing the type of bulk pricing update you wish to perform. 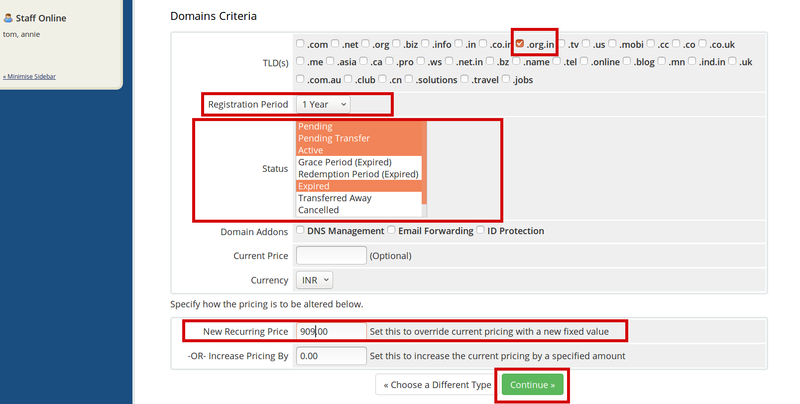 In my example I am going to modify domain pricing, so click on Domains button. 6) Next you’ll be asked to set the criteria for the update. First we selecte TLD(s) at the top you would like to change the price for by ticking the checkbox next to the specific TLD, here i selected .org.in pricing. Next we select the Billing Cycles you want to apply the change to. 7) The next step will show you a preview of the changes allowing you to confirm your selections before confirming and performing the change. If you’re happy with the summary, click Perform Update to begin the changes. You can repeat this process as many times as needed to cover all the different product or domain registration periods and domain addon combinations you wish to change. I've been working in Technical Section for over 10 years in a wide range of tech jobs from Tech Support to Software Testing. I started writing blog for my future reference and useful for all.